+30 26510 41160 | info@gorillashoots.gr | QUESTIONS? GORILLA SHOOTS is now one of the most known companies of cartridges production in Greece. It resides in the industrial region of Ioannina, a city that lives with hunting. The company became quickly known in Greece for the great attention given to the sections of quality and stability of her production. Today, after 8 years of total acceptance by the Greek hunters, Gorilla Shoots cartridges distinguish from the competition and are between the first preferences of Greek hunters and shooters. The Overmax GX 40gr is the cartridge with the highest concentration, over 80% at 36m, than any other conventional cartridge of the competition. Prey can occur at a distance of 10m to 60m. Here is the problem of firing that can hurt prey in this range of distances and especially of distant shots. The Overmax GX 40gr with the special loading technique comes to give the solution to game hunting such as hare, rays, small and large aquatic. 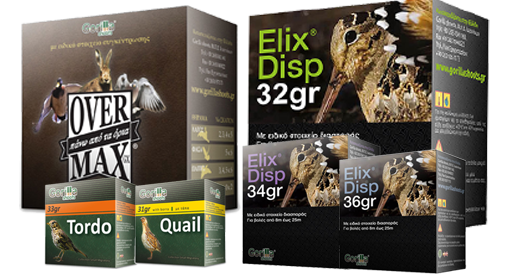 Τhe Elix Disp 34gr cartridges with the largest opening shot than any other conventional cartridge dispersion. The specific element dispersion Elix Disp 34gr offers 45% larger opening shot and stunning distribution without spaces and "holes" than any other cartridge dispersion. It stands out particularly at low temperatures and humidity due to the special charge of. The Elix Disp 34gr for shots very short 8-25 meters. Use all hunts required quick instinctive musketry. The enhanced charge of 34gr increases the number of shot, resulting in a high density of the shot. The Elix Disp 34gr can be used by all guns cal 12, double-barreled shotguns with barrels of 70mm or 76mm.